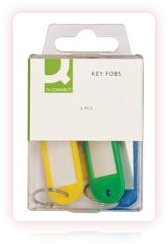 Q Connect Key Fobs. Splitring keyrings with a coloured label holder. Supplied in handy packs of 6 assorted colours. Please note :- This Item is not available on timed and express deliveries.